Over the past few years, crowdfunding platforms have become more popular. Just within 5 years, the number of the platforms had risen from 21 websites in 2007 to 143 websites in 2011 (a). Crowdfunding platforms offer the opportunities for people to pursue their dreams or to raise money for good a cause. On the other end of the spectrum, these platforms also provide opportunities for investment. However, as the popularity goes up, controlling this growing community is challenging since there are no concrete law or regulations, as can be seen in fraud cases occurring across crowdfunding platforms. 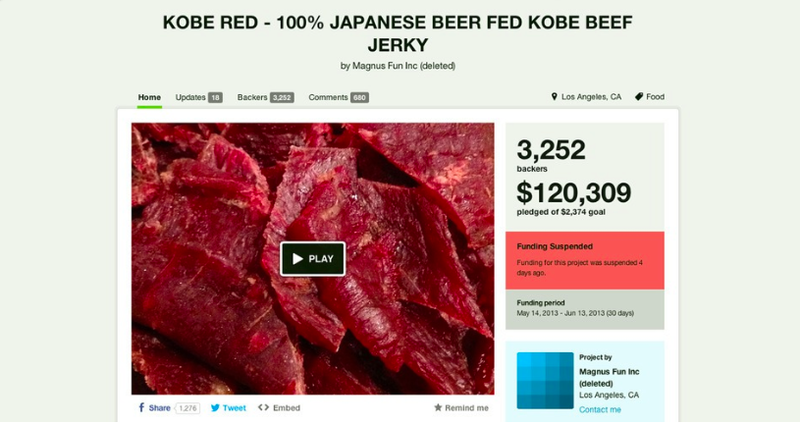 Take for example the Kobe-red project on Kickstarter, which was intended to raise money for beef-based jerky made with 100% organic and beer-fed Japanese cow. This project was supported by 3,252 funders generating over $120,000! Being as successful, it was approached by two filmmakers who would like to include this project in a documentary called Kickstarted. Looking back on hindsight, it was then discovered that many features provided by the project creators on the page were suspicious, raising concerns about the legitimacy of the project. For example, there were unlisted creators’ names, a sloppy video presentation and not very trustworthy iPhone screenshots as “proof of taste testimonies”. Even though these filmmakers eventually established contact with the project creators, they never received any supporting materials about the project as was promised. Worse, the project creators single-handedly claimed and announced about it being featured in a documentary (even though no follow-up was done with the filmmakers), earning the project even more money and increased credibility. Luckily, the project was eventually suspended before the deadline by Kickstarter, before the damage of more than $120,000 could have occurred. After the revelation of this scam, Kickstarter started to allow users to communicate suspiciousness by a “Report this project button” in case a project raises suspiciousness regarding credibility and trustworthiness. Be aware, not only creators could pull scams at crowdfunding platforms, funders also have found their way. Encik Farhan funded approximately 158 projects on Kickstarter but cancelled the credit card transactions after receiving the rewards from the creators of the projects. This story came to light after creators started asking each other whether they were experiencing the same problems with this funder. Encik Farhan eventually got banned from Kickstarter. However, kickstarter claims that creators have an ability to report users and cancel those users’ pledge but it is still unclear who will absorb the incurred cost. Well, the idea of people coming together and create something good together online is beautiful and grand. But as long as these crowdfunding platforms do not have thorough policies that can protect creators and funders, we need to keep in mind that not everybody out there has a good heart and honesty. Previous PostCrowdfunding: only 986 years left?Next PostElementary, my dear Watson.